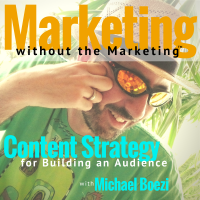 Building an audience is difficult work, and you don’t want to create any extra friction. So what can you do to not have it be a huge burden on the organization? If the outcomes outweigh the time spent, then you’ll feel like it’s worth it. But if you feel like the process is heavy, then it won’t feel like it’s worth the effort. Like I mentioned in last week’s episode, your goal should be to get really efficient. A huge factor in your social media marketing ROI is the time spent. But if you don’t give it a genuine effort, how do you expect to have it be effective? You see others do it. You see your competitors succeeding. What are they doing differently? They have no distinct advantage over you. Everyone starts the same: no followers, no friends. It’s an equal playing field. The secret to what they’re doing is 1) producing the right content, and 2) getting the most out of each hour spent on social media. To me, that starts with channel selection. Neither of these things will work well unless you’ve been really judicious about which channels you’ll devote your time to. But as you might imagine, there’s a science to this. No guessing. No assumptions that just because “everyone’s” on Facebook, it means that Facebook will be your best channel. Your audience may not adhere to those rules. Every audience is different. To me, the thing that’s fun about it is that it requires an incredible amount of creativity. One-size-fits-all just doesn’t work – and what you put into it is what you’ll get out of it. In this episode, I get into the importance of the starting point: channel selection. Peter Brooks at the International Institute of IT Economics reports that Facebook, Twitter, and LinkedIn still dominate in the business world. The percentage of businesses who use each are 95%, 87%, and 69%, respectively. Start to introduce stimuli into the market. Adjust and iterate as needed until you start to see enough evidence that it’s working.